The IACC needs to address #autism and #wandering. How can parents help. The Interagency Autism Coordinating Committee (IACC) is meeting again on January 12, 2016 (1.) On the TACA blog we have written about the IACC for years (2.) Let me catch you up: IACC was founded by funds from the Combatting Autism bill in 2006. About $3 billion has been spent. Sadly, the efforts have not produced any measurable results. No breakthrough in science or treatment. No help for families living with autism. But what we have experienced during this time is a rapid increase of autism. A recent parent survey in October 2015 concluded the 1 in 45 autism prevalence rate (3.) The IACC met one time in 2015. We see little urgency in their actions and ability to drive positive change for families. It just isn’t happening. Maybe this new committee debuted in November 2015 will be different. The autism community has also experienced tragedy. Individuals with autism are wandering and dying. 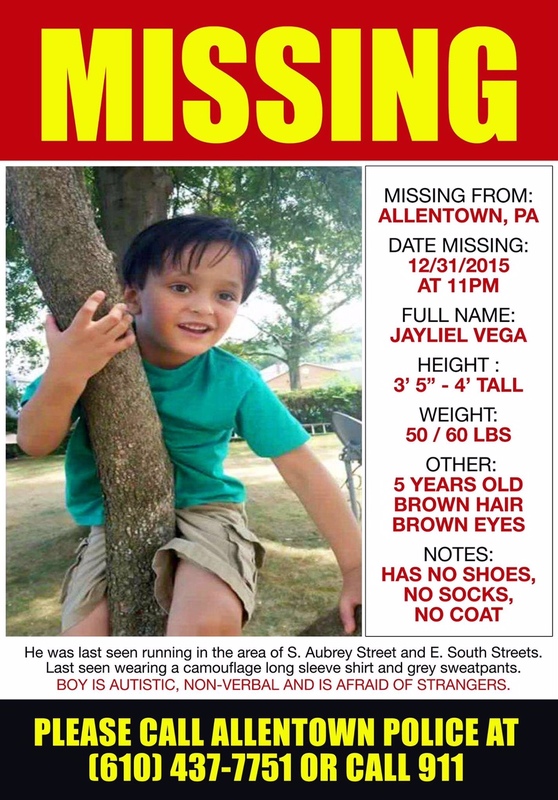 Already in 2016, Jayiel Vega Batista wandered on New Years Eve and died (4.) He was only 5. Since June 2015, 30 individuals with autism have died due to wandering. Those are just the cases reported. We are saddened by these lives lost. Now we need to channel our energy to drive action. Action that can save lives. We need to act for all families who live with the fear of their child escaping from a secure, safe home with deadly consequences. Here is what I suggest you do: Time to activate the IACC. Sure we have a lot of ground to cover with the IACC. They need to move towards productivity from science to cause (including environmental issues,) declaring autism an epidemic, work with a sense of urgency, prevention and funding for families living with autism. But how about first we work on helping individuals with autism live and not die first then we can tackle the rest.